produces many different con? gurations state-of-the-art equipment to provide cranes. Allied Marine Services (Allied) was Doors and Hatches: Watertight, Fire tions, power plants, industrial/manufac- turing facilities. formed in 1983 with the express pur- Rated Electronics / Navigation / Auto- pose of acting as a sales representative pilots. See feature story on page 44. Senner, LLC has sold approximately 4,000 Reintjes rine representative for EPD in 2015. In 1967, Karl sold the ? 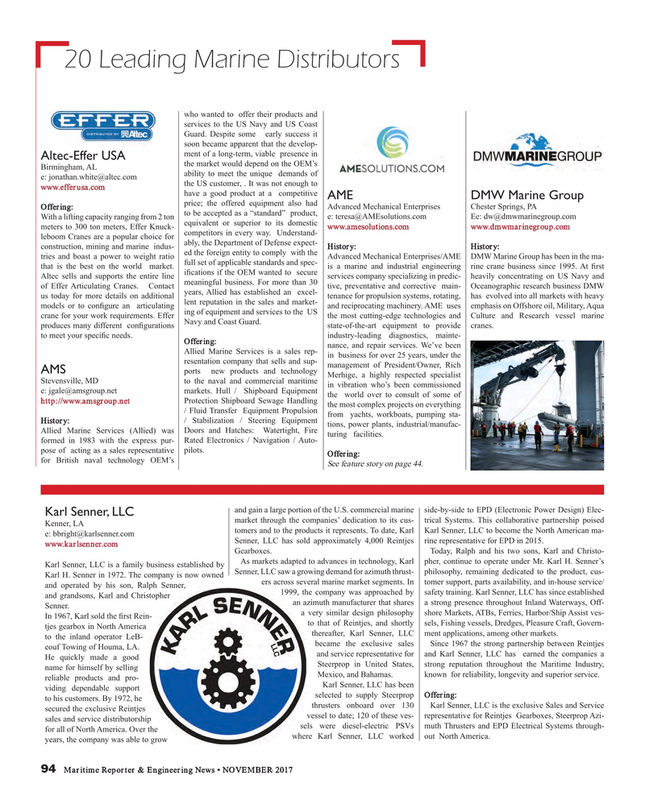 rst Rein- to that of Reintjes, and shortly sels, Fishing vessels, Dredges, Pleasure Craft, Govern- tjes gearbox in North America thereafter, Karl Senner, LLC ment applications, among other markets. Mexico, and Bahamas. known for reliability, longevity and superior service. Karl Senner, LLC has been viding dependable support selected to supply Steerprop Offering: to his customers. By 1972, he thrusters onboard over 130 Karl Senner, LLC is the exclusive Sales and Service secured the exclusive Reintjes vessel to date; 120 of these ves- representative for Reintjes Gearboxes, Steerprop Azi- sales and service distributorship sels were diesel-electric PSVs muth Thrusters and EPD Electrical Systems through- for all of North America. Over the where Karl Senner, LLC worked out North America.